We study the confluence of higher-order pattern rewrite systems modulo an equational theory E. This problem has been investigated by Mayr and Nipkow , for the case of rewriting modulo a congruence à la Huet . The case we address here is rewriting using matching modulo E as done in the first-order case by Jouannaud and Kirchner . The theory is then applied to the case of AC-theories, for which we provided a complete unification algorithm in . It happens that the AC-unifiers may have to be constrained by some flexible-flexible equations of the form λx 1 ... λx n .F(x 1,...,x n ) = λx 1 ... λx n F(x π(1),...,x π(n)), where F is a free variable and π a permutation. This situation requires a slight technical adaptation of the theory. 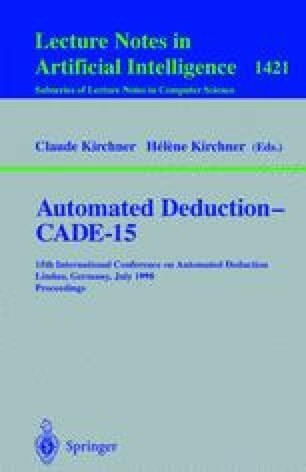 This research was supported in part by the EWG CCL, the HCM Network CONSOLE, and the “GDR de programmation du CNRS”.